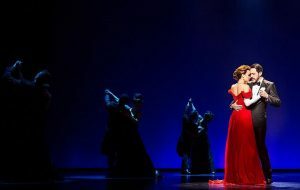 If you loved the 1990 romantic comedy movie starring Richard Gere and Julia Roberts, directed and choreographed by Garry Marshall, you won’t be disappointed in the show turned into a musical. Pretty Woman: the Musical opened its world premiere at Broadway in Chicago’s Oriental Theatre, March 28, complete with red carpet, flashing lights and New York and LA industry VIPS. But it was the magic on stage wrought by Samantha Barks as Vivian, a Hollywood Blvd. upwardly-mobile-dreaming prostitute who knows cars, Steve Kazee as Edward, a heartless take-over mogul, Orfeh as Vivian’s friend Kit and Eric Anderson as Mr. Thompson the friendly hotel manager of the Regent Beverly Wilshire Hotel (also plays Happy Man, a Hollywood Blvd. denizen) that captured the audience’s attention and got a well-deserved standing ovation. Directed by Jerry Mitchell, the musical moves seamlessly through memorable film scenes from bathtub singing to Rodeo Drive shopping. 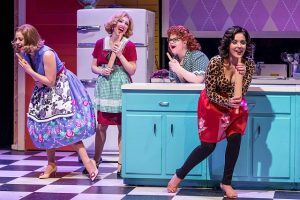 The musical, ‘A Taste of Things to Come,’ written by Debra Barsha and Hollye Levin, starts out in 1957 with four women living in Winnetka who meet once a week to prepare for an upcoming Betty Crocker cooking contest that they hope to win. Sharing recipes is how their gatherings begin. While they chop, mix, and measure ingredients, they also read current articles in popular magazines, many of which lead their conversations down a non-culinary path of female frustrations, shared worries, and confidential secrets. Joan Smith (played by Cortney Wolfson) is the weekly hostess to her three friends: Connie Olsen (Libby Servais), Agnes Crookshank (Linedy Genao) and Dottie O’Farrell (Marissa Rosen). Joan changed her last name to Smith so that her neighbors won’t care about her real religion. Connie is pregnant and worries that her baby might not be born with her husband’s looks—especially when she reveals to her three friends that she had an affair. Agnes is a single woman who discovers that her background is more diverse than the suburb where she was raised. And Dottie, a mother of many children, is overweight and takes numerous pills—before and after eating everything in sight—to try to shed pounds. When Joan introduces them to a different piece of writing, the Kinsey report, they interact in more engaging conversations regarding the sexual revolution. 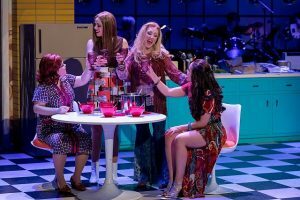 In the first act, rock ’n roll is ever-present with wonderful voices and fabulous dancing by the four friends to the production’s live music provided by a talented all-female orchestra. Joan states that “lots of things bubble up in the kitchen.” That comment comes to life when racial, political, and other issues begin to surface as the women try to understand how to address them along with their personal needs. The second act takes place ten years later in 1967, All but Dottie are hardly recognizable. Marissa Rosen (Dottie O’Farrell), Cortney Wolfson (Joan Smith), Libby Servais (Connie Olsen) and Linedy Genao (Agnes Crookshank) in A Taste of Things to Come. Joan, Connie, and Agnes are dressed like models and hippies and have taken on lives and professions of their own. This causes Dottie to feel sad and separated from them. But when she describes how her “profession” is a mother to all of her children no matter what their ages are along with being president of the school’s PTA, not only do her three friends support her, the audience breaks into wild applause. ‘A Taste of Things to Come,’ directed and choreographed by Lorin Latarro, is a fantastic musical comedy that pays tribute to generations of females who paved the way for the important lives that many women currently embrace, along with the adventuresome and creative journeys that other women are pursuing. DETAILS: ‘A Taste of Things to Come’ is at the Broadway Playhouse at Water Tower Place, 175 E. Chestnut St., Chicago, through April 29, 2018. Running time: two hours with one intermission. For tickets and other information, cal (800) 775-2000 or visit Broadway in Chicago. ‘Guess Who’s Coming to Dinner’ is Delicious! 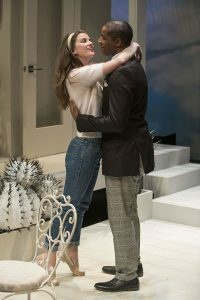 Twenty-three year old Joanna “Joey” Drayton (Bryce Gangel) returns home from an extended absence anxious to share the news with her parents that she has found the love of her life, and that the two are planning to marry. The couple’s news will test everyone’s commitment to their own values, revealing their previously acknowledged and unacknowledged prejudices. The year is 1967, the height of the civil rights era. The Draytons are best described as an affluent liberal white family. Joey’s new boyfriend, Dr. John Prentice (Michael Aaron Pogue), is black. Dad, Matt Drayton (Tim Hopper) is the publisher of a progressive newspaper while mom, Christina (Mary Beth Fisher) is the owner of an upscale art gallery. Joey has secretly decided to surprise everyone by inviting the Dr. Prentice’s mother and father (Jacqueline Williams and Dexter Zollicoffer) to a family dinner that includes her dad’s close friend, Monsignor Ryan (Dan Waller). The meal will be prepared by the Drayton’s long-time African-American domestic helper, Matilda “Tillie” Binks (Sydney Charles). Both the Monsignor and Tillie are considered to be a part of the Drayton’s extended family. 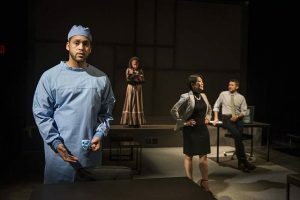 “Guess Who’s Coming to Dinner” at the Court Theatre by Todd Kreidler is based on the screenplay by William Rose for the movie of the same title. Joey Drayton (Bryce Gangel) and Dr. John Prentice (Michael Aaron Pogue) in Guess Who’s Coming to Dinner at Court Theatre. The movie version featuring Spencer Tracy, Katherine Hepburn and Sidney Poitier, was a turning point in “race relations” in the late 1960s. Tracy’s final soliloquy is often excerpted as an example of racial tolerance as well as an example of fine acting. 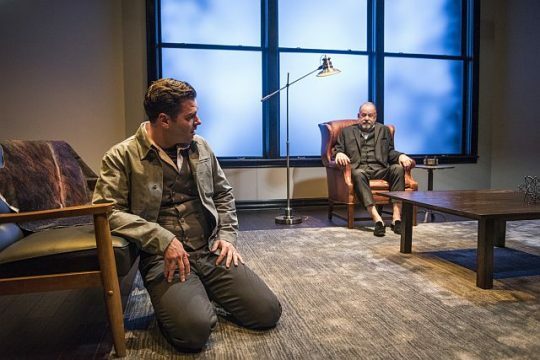 In short these current actors have big shoes to fill, ultimately doing a really fine job of finding their own voice and putting their own interpretation on each of their roles. 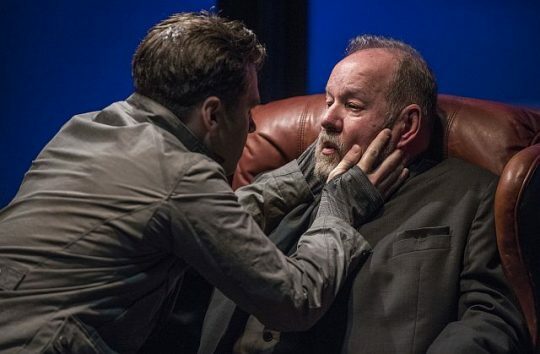 This production is expertly directed by Marti Lyons who keeps the pace lively and helps the actors adeptly avoid the challenges related to performing this iconic material. This is a perfect ensemble in which there is no need to draw attention to any one actor except to say that the roles of Tillie and Monsignor Ryan bring much appreciated, occasional comic relief which each of the respective performers do without distracting from the essence of the story-line. Likewise Bryce Gangel as the ingénue character at the center of the storm perfectly presented bright eyed optimism and youthful exuberance tempered with an undeniable realism. 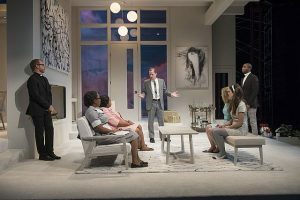 The monochromatic set by Scott Davis includes white cacti on the patio and unornamented, mid-century furnishings with avant-garde artwork prepared by scenic artists Scott Gerwitz and Julie Ruscitti. The black and white palette reminds us that we are literally dealing with a black and white issue that have shades of gray with only occasional hopeful bursts of color. Costume Designer (Samantha Jones) whom I remember from The Court Theatre’s “Belle of Amherst,” really knows how to make exceptional clothing for her women that complements the production. In this case the colorful artistic outfit for Hilary St. George who appears at the very beginning of the play immediately helps to set the time period and give us some insight into the flamboyant aspect of the character. Christina Drayton’s dinner outfit with shawl is the perfect at-home informal hostess attire, and Joey’s simple cocktail dress with gray tights is exquisitely tailored with a sixties vibe. Both used tone-on-tone fabrics that stay in the monochromatic color range without being simply black and white. It was fun to be a part of this mixed age group audience for this particular play in the center of Hyde Park, long recognized as a liberal multi-racial and multi-cultural community. The laughs and gasps were more audible and more frequent then I have heard in a while and which I am certain was a result of many of the audience members understanding this material in a more intimate and first hand way, as either participants or witnesses to similar real life stories. 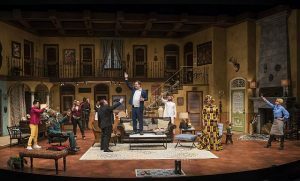 DETAILS: “Guess Who’s Coming to Dinner” is at the Court Theatre (on the campus of the University of Chicago) at 5535 S. Ellis, Chicago, through April 15, 2018. For tickets and other information call (773)753-4472 or visit CourtTheatre. Author Jodie JacobsPosted on March 26, 2018 Categories Guest Reviewer Reno Lovison, Reviews, TheaterTags Court Theatre, Guess Who's Coming to Dinner, Jodie Jacobs editor, Theatre in ChicagoLeave a comment on ‘Guess Who’s Coming to Dinner’ is Delicious!